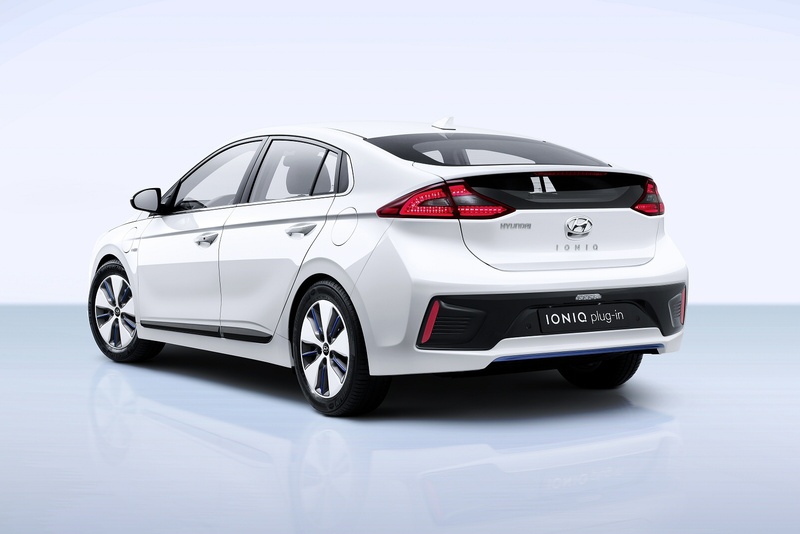 The Hyundai IONIQ distinguished itself as the first car ever to go on sale with three different forms of electric power. 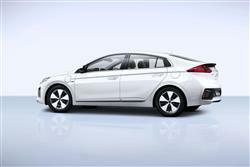 Buyers choose from pure electric propulsion, hybrid propulsion or, as in this case, a Plug-in hybrid model. Given the choice between these three options, we think most potential buyers would probably take the Plug-in route if money was no object - and it's easy to see why, with up to 39 miles of all-electric driving range and CO2 emissions as low as 26g/km. 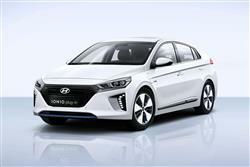 Hyundai is serious about eco-motoring. Deadly serious. Between now and 2020, the company plans to launch no fewer than 14 eco-minded models, including five hybrid vehicles, four plug-in hybrid vehicles, four electric vehicles and one fuel-cell electric vehicle. Whether any of them will be cleverer than this IONIQ Plug-in contender though, is debateable. It's the most affordable plug-in model of its kind on the market - for the time being anyway, aiming to offer buyers the best of both worlds; the all-electric capability of the full-Electric IONIQ model. 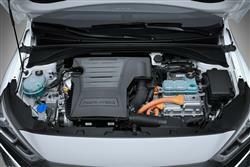 And the range capability of the full-Hybrid version of this car. Sounds promising. 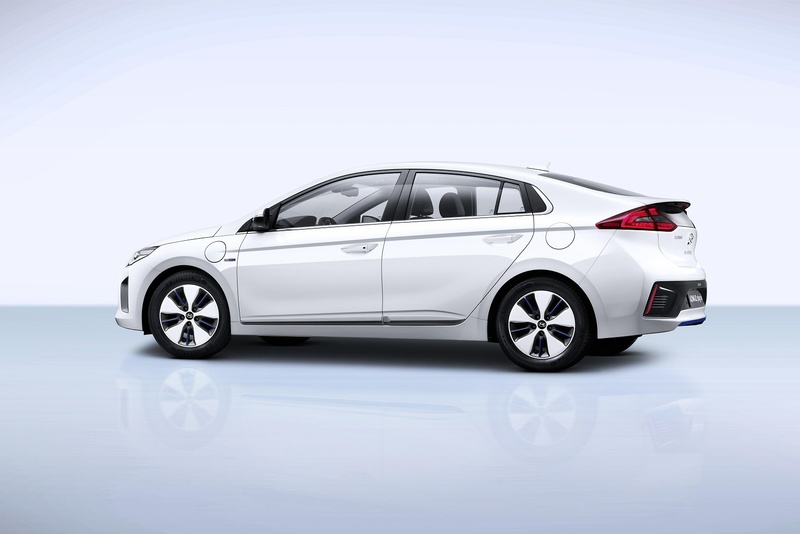 In an IONIQ Plug-in, there's obviously much more potential for extended full-electric use than there is in the ordinary full-Hybrid model, thanks to the greater capacity of a considerably larger 8.9kWh battery that drives a pokier 61PS electric motor. Despite that, total system output remains pegged at 141PS, so ultimate performance is pretty much the same as it is with the ordinary Hybrid variant, though initial acceleration seems quicker thanks to the torque of the electric motor. Mind you, use too much of that and you'll quickly decimate the NEDC-rated 39 mile all-electric driving range. The IONIQ shares the same basic platform as the Kia Niro, which is a very good place to start from. As a result, the Hyundai handles nimbly and takes corners with more composure than you might expect for a car that's main focus is on low running costs and emissions. The only limiting factor is the reduced rolling resistance tyres, but in day to day driving you'll find this car very capable. It also enjoys a tight turning circle and steering that's light to turn at low speeds. You can add some more weight to the helm by selecting the 'Sport' mode, but we find this makes it too heavy. Around town, the suspension is on the firmer side of comfortable but by no means unsettled. Accelerate hard and you'll really notice the benefits of this IONIQ's use of a proper cog-driven 6DCT dual-clutch auto transmission, a much better gearbox than the jerky belt-driven set-up used in a rival Toyota Prius and other hybrids. There's not much point building a new car that offers three different electrified power trains for the first time ever if you're not going to make the most of every facet of its design. This is why Hyundai has gone to great lengths with the IONIQ to come up with a shape that has a drag coefficient of just 0.24. That makes this one of the most slippery shapes ever for a car as it cuts through the air, which helps reduce energy use and noise. And inside? Well, inside this Hyundai, it doesn't feel futuristic. It's not that it's dull in the cabin: it's just that it's not trying to be too clever for its own good. We like that. 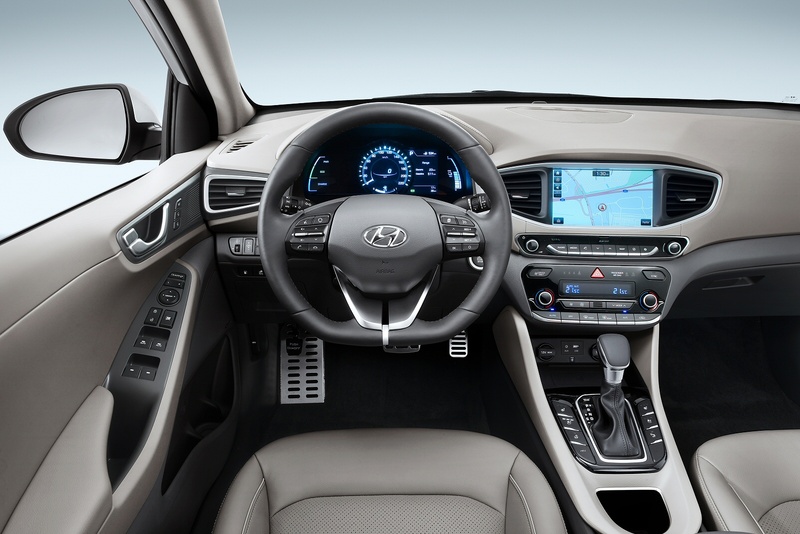 What you get is a dash that bears a strong resemblance to the Korean company's other models such as the i30 and Tuscon. That's a very good thing as it's clear and made from excellent materials. There are hints, though, at what lies under the bonnet, such as the battery indicator gauge on the left-hand side of the main 7-inch instrument display. It tells you how economically you're driving and whether or not you are using energy reserves or topping them up. In the centre is a simple to read speedo, while on the right is a configurable screen for information such as doors left open and water temperature. 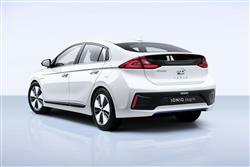 Both IONIQ Hybrid models get a 443-litre boot. Once you've subtracted the £2,500 government Plug-in Car Grant from the asking price, you'll be paying around £25,000 for this car. That looks at first glance quite a lot more than is being asked for the full-Hybrid IONIQ derivative, but that's because the Plug-in model isn't being offered in base 'SE' form, the range limited to the plusher 'Premium' and 'Premium SE' trim levels. Compare against these and you should find that the extra required to upgrade to Plug-in motoring isn't really very much at all. That grant (not available to buyers of the standard full-Hybrid version) deals with much of the difference there would otherwise be. Equipment levels are quite comprehensive, with all models featuring keyless entry with push button start, heated front seats, a heated steering wheel, Bi-Xenon headlamps with LED rear combination lamps and a driver's supervision instrument cluster with a 7" LCD display. Integrated satellite navigation with TomTom Live services, an Infinity audio system with Android Auto / Apple CarPlay and Wireless Phone Charging (where supported) also feature as standard. Standard safety features include Autonomous Emergency Braking (AEB), a Lane Keep Assist System (LKAS) and a Tyre Pressure Monitoring System. The IONIQ Plug-in model's engine, a 1.6 GDI direct-injection petrol four-cylinder unit with a class-leading thermal efficiency rating of 40%, is a good place to start in the design of this car. In combination with the 61PS electric motor powered by a 8.9 kWh lithium-ion polymer battery, it makes possible a CO2 emission reading of up to 26g/km. The combined cycle fuel return is supposed to be around 130mpg, though as with any plug-in model, you can take that reading with a pinch of salt. The important thing though, is that the government believes it, hence the low BIK tax liabilities this IONIQ Plug-in model will deliver for you. As for the NEDC-rated 39-mile driving range potential, well that's significantly further than you can go in other rival Plug-in models. A pricier Prius Plug-in, for example, offers a rated 30-mile range. Charging an IONIQ Plug-in Hybrid takes 2hours 15mins using a 3.3 kW AC charger. Finally, let's talk warranties. Most modern cars come only with an unimpressive three year/60,000 deal. 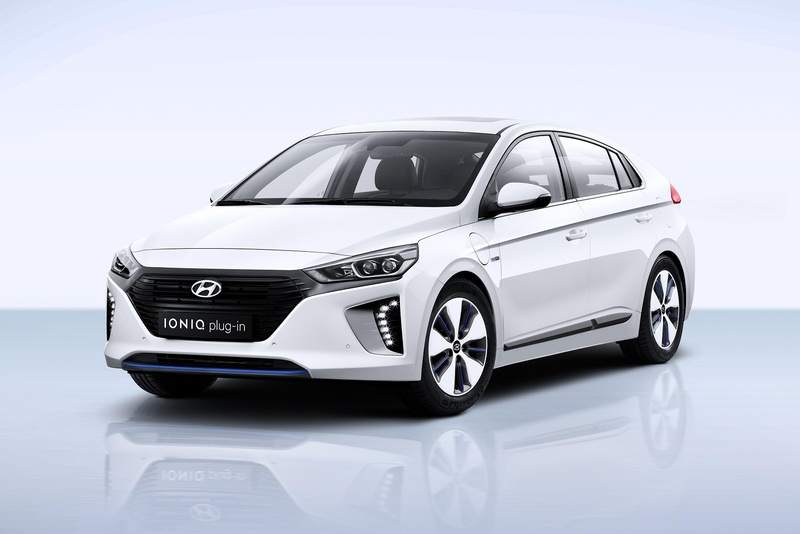 With this IONIQ, in contrast, a much more complete peace of mind package comes as standard thanks to one of the best customer assurance plans in the industry. The Five Year Triple Care warranty includes five years of mechanical cover with no mileage limit, annual vehicle health checks and roadside assistance. If you�re looking for a new Hyundai Ioniq 1.6 GDi Plug-in Hybrid Premium 5dr DCT Hatchback for sale, you�ve come to the right place. At Bristol Street Motors we don�t just have the best Hyundai Ioniq 1.6 GDi Plug-in Hybrid Premium 5dr DCT Hatchback deals, we also offer friendly advice and help with all your enquiries to ensure your buying experience is a happy experience.